Microcomputer will figure out the rotating speed to send out master batch automatically with parameters of mold weight, ratio of master batch and plasticizing time from control panel. Installed in the doser base and is for sucking the iron impurities out of the plastics. 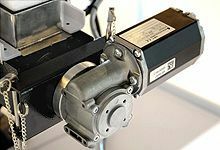 It is driven by the feeding motor to rotate to take the material to the base. Drive the feeding screw to rotate to take the material to the base. SCM series volumetric dosers are suitable for auto-proportional mixing of virgin materials, regrinds, master batch or additives. A gear motor with gear ratio of 38:1 is coupled to a dosing screw of 12, 16,20 or 30mm(0.47, 0.63,0.79 or 1.18inch) in diameter to give a total of four models with output ranging from 0.1~110kg/hr(0.22~242.5Ib). Double-color dosers is available for collocating with any two of single color dosers if required. Five components automatic mixing can be realized if customers adopt four-color dosers. 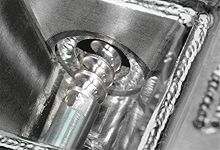 Hopper magnets are equipped in standard base to avoid molding machine screw damage. External signals can be directly input to control box. The current mode can be recorded without interrupted by power failure. Compulsory material cleaning makes it easier to replace masterbatch. 50 recipes are available for permanent recording of material discharging time and finished products weight (for extruder, it is max. throughput per minute). Both masterbatch blockage and overload can be detected, then machine will halt and sound an alarm. 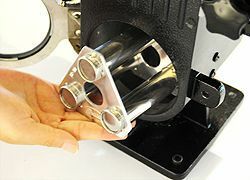 Based on customers demand, mold cycles can be set to add additives periodically so that micro-metering can be achieved. SCM-4 is standard equipped with a main hopper and a blender. Equipped with RS485 communication function (SCM-4 excluded). 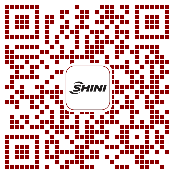 For collocating with SHD-100~300 or SHD-160U~450U dryers, heavy base should be selected. 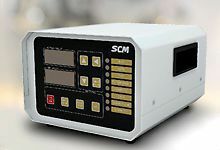 SCM-4 is capable of adding four kinds of masterbatch at most. High temperature doser SCM-H is optional for applying to PET high temperature situation; the water runs in its cooling part must be room temperature water. Blender is an option for customers to make materials evenly mixed. Main material hopper is optional equipment for customers to feed main material. Low level sensor can be opted to give an alarm when masterbatch is insufficient. Screws with diameter of 30mm/1.18inch can meet customers, requirements of large output. Optional 100kg/220Ib base to satisfy maximum discharge volume(without mixing function).